In the image below the Cross section view page has been selected, and photographs of the cross section of the hair of the selected species is visible. If you cannot see all the slides at once, click on the Small Images button to show the images at reduced size or scroll using the scroll bars. Assume that a check of the hair sample shows eye shaped cross section with distinctly pointed ends. This would imply that the hair sample most likely came from Pseudocheirus archeri (Green Ring Tail Possum). 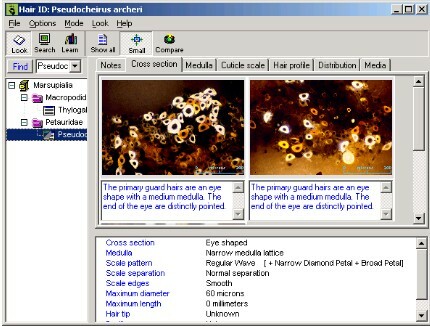 Check your identification and learn more about the hair of Pseudocheirus archeri by clicking on the Medulla and other selection tabs to see the other view pages in the look view. The image below shows the small images of the hair cross section for Pseudocheirus archeri. To learn more about Hair ID read the Help file. This can be accessed from the Help Menu, or by pressing F1 while Hair ID is running. To learn more about the structure of hair and hair analysis, read the documents in the Learn Mode. Click Tutorial to return to the start of the tutorial.